Maison Jacynthe Fluide De Teint/Fluid Complexion in 03 Cream ~ $46.00 CAN. Camouflages perfectly with an ultra natural finish. It helps to unify the complexion in lightness. Its formula based on borage oil and coffee protects and moisturizes the skin. Its soft texture and delicately scented with argan makes it a must for its makeup in everyday life. I'm not sure if I have tried an all natural foundation before so I am looking forward to trying this out! I will say that the shade range did leave a little to be desired - there is only 6 shades available in the range, which I think may be hard for everyone to match their proper shade, both dark and light skintones. So, I would like to see the range expanded. I picked the shade Cream which is described as "For medium skin with a naturally neutral foundation." Now, I am more of a light-medium skintone; however, the light-medium shade in this range had golden undertones and I have more neutral undertones. This is described as an ultra natural finish so I am expecting a lighter coverage foundation! I like that this foundation has a pump top - that's always a bonus for me. It is just over 1 fluid oz, making it a pretty normal foundation size. This was a nice texture for me and I think this will be a pretty good colour match on my face. This is the Maison Jacynthe foundation on me. I will say that this foundation is a light to buildable medium coverage foundation. I did think that after 1 coat it covered my redness easily and left my skin looking really natural. Now, I probably didn't need a 2nd coat, but the first coat was really light and I tend to wear more medium to full coverage foundations so I wanted a touch more coverage! (I can tend to be a little self-conscious about my redness and spots, but really looking at the picture with 1 coat, I do think it is gives a really natural, but healthy look!) Even with 2 coats, it didn't feel heavy at all! Maison Jacynthe Illuminator in 02 Lune Rose/Pink Moon ~ $33.00. The natural illuminator has excellent hold for a sublimated and structured complexion. Its formula based on coffee extracts, corn, macadamia oil and apricot, brings radiance and hydration to the skin. Maison Jacynthe has 3 highlighters - Sparkling Sun, Pink Moon and Black Moon - I thought all 3 were really pretty; but, Pink Moon was described as a shiny golden pink! This shade is absolutely gorgeous! Each of the powder products from Maison Jacynthe come in these refill packages and you can buy compact palettes from them; but, I have an empty palette that I will add it in to! I'm impressed with the pigmentation of this highlighter! This went on smoothly and it was really impactful on my cheeks! Again, this lasted all day and still looked good! I do love this shade and i'm happy that it wears so well! 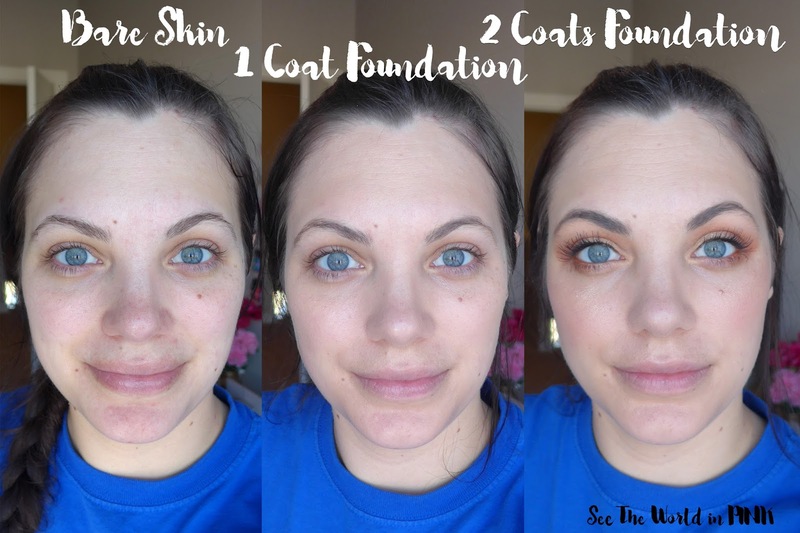 Here is the whole look with 2 coats of foundation and the highlighter! Again, I'm happy with both of these products! For this look, I also used the Smashbox Covershot Ablaze palette on the eyes, L'Oreal Lash Paradise mascara, Shiseido Luminizing Satin Face Colour in RD103 for blush, and Tarte Tarteist Quick Matte Paint in Homeslice on the lips. 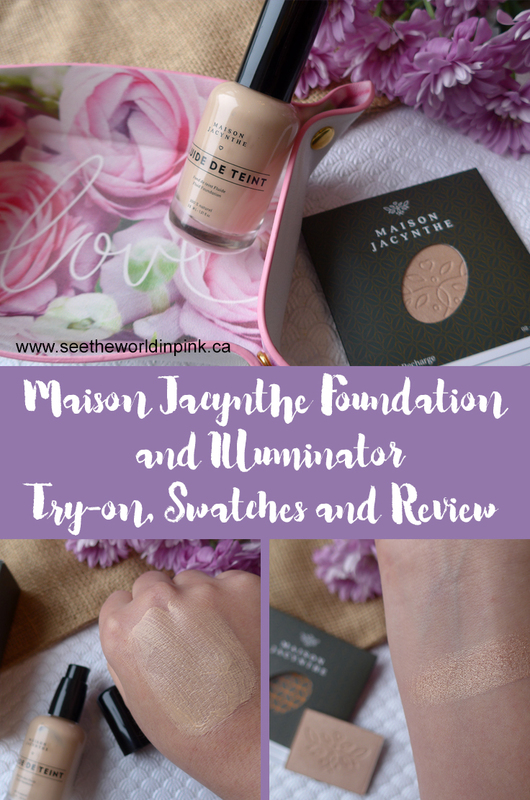 Have you tried Maison Jacynthe makeup yet? I tried the highlighter too and I LOVE IT. It's now my go-to highlighter! Yes - it's so gorgeous!! Thank you! Hope you check them out!